Compare and contrast: Gustav Dore's "Satan Walking in the Garden" from Paradise Lost on the left. 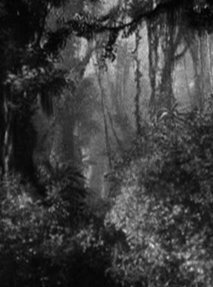 A detail of the jungle in King Kong (1933) on the right. Skull Island is one of the greatest imaginary landscapes ever to grace the movies. The quality of the production design and set decoration in this section of King Kong (1933) is phenomenal. As many have remarked, the backgrounds look like the work of Gustav Doré, the popular 19th century French illustrator and master engraver. The impression is intentional. 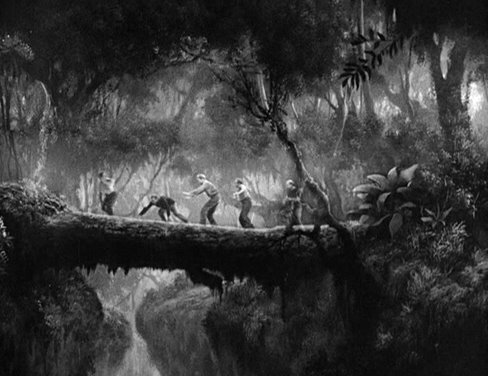 Chief technician Willis O’Brien asked artists Mario Larrinaga and Byron Crabbe to come up with backgrounds in the style of Doré to set the scene on Skull Island. 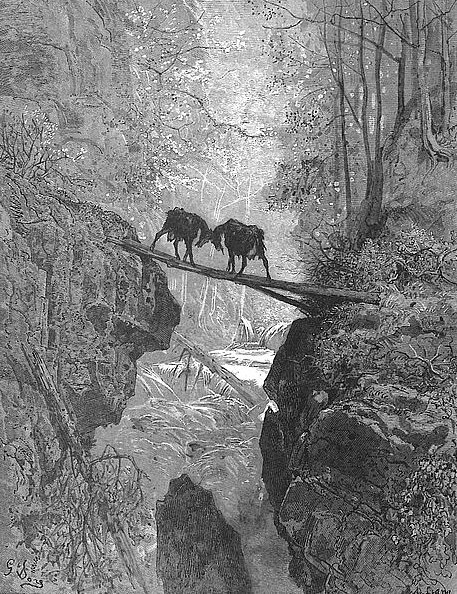 With his choice of Doré, O’Brien embraced a wild, mysterious, romantic approach. 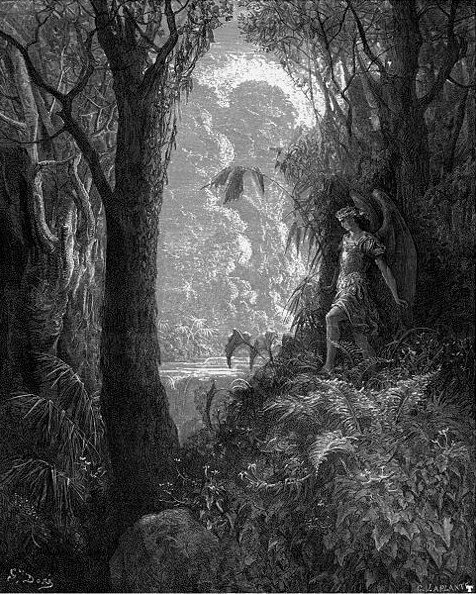 Doré’s backgrounds often achieve a semblance of great depth through their stylistic use of differently lit planes to give the impression of receding distance. This contributes to their other-worldly, even primeval, appearance. Mario Larrinaga and Byron Crabbe sketched hundreds of drawings, marrying O’Brien’s visual ideas with Doré’s style. O’Brien selected his favorite sketches and worked with Larrinaga and Crabbe to capture them on glass paintings and painted canvas backings. For a complex scene, the camera might be set up to peer through up to three mounted panes of painted glass and then a final opaque painted canvas. Between the mounts, the technicians would place additional prop foliage to create even more layers of receding depth. Like a Doré engraving, the film image presents sharp detail in the foreground then subtly transitions to more impressionistic shapes in the distance. The Fables of La Fontaine, 1867. Log crossing in King Kong (1933). 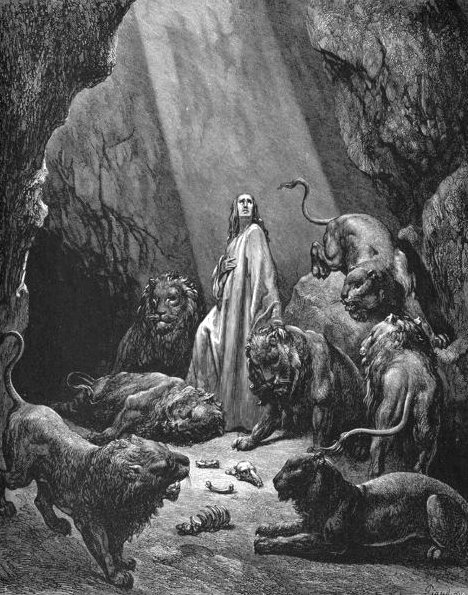 Lion's Den," one of his Bible illustrations, 1866. 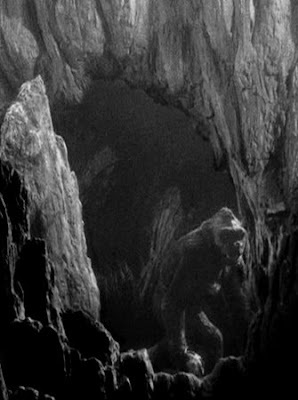 Cave entrance in King Kong. 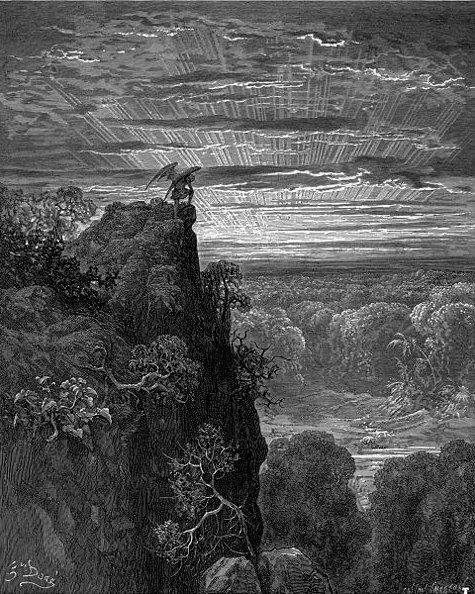 A high ledge in Dore's "Satan Overlooking Mt. Nephrates"
A high ledge in King Kong. Compare and contrast: Fay Wray and Joel McCrae chased through the jungle in The Most Dangerous Game (1932) on the left. 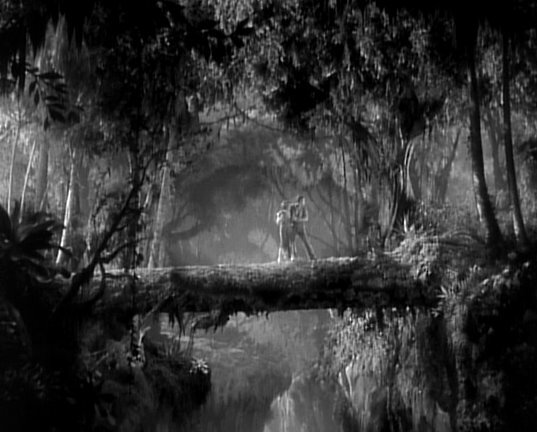 Fay Wray and Bruce Cabot chased through the jungle in King Kong (1933) on the right. 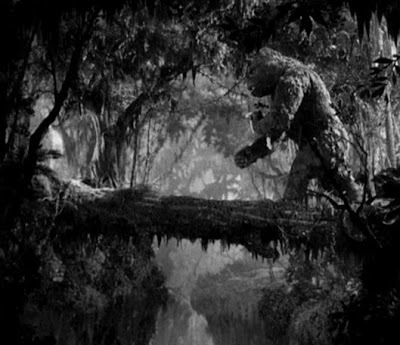 To keep costs appearing reasonable on the studio balance books, co-producer Merian C. Cooper borrowed much of Skull Island’s foreground from sets prepared for—and charged to the account of—other RKO movies. The Great Wall that separates the native village from the wilds of Skull Island is a redressed Jerusalem wall from The King of Kings (1927). Some of the native village huts are leftovers from Bird of Paradise (1932). But Cooper’s biggest steals of all were from The Most Dangerous Game. Still in production during Kong’s early shooting days, The Most Dangerous Game was being filmed by Kong co-director Ernest Schoedsack and happened to co-star Kong actors Fay Wray and Robert Armstrong. Since The Most Dangerous Game took place on a remote jungle island, Cooper realized their settings could be virtually interchangeable. He looked for serendipitous opportunities to piggy-back his complex ape movie on Schoedsack’s simpler adventure-romance. Thanks to the combined skills of RKO’s set designers and Willis O’Brien’s technicians, Kong’s visual mix of borrowed sets and original glass paintings works nearly seamlessly. 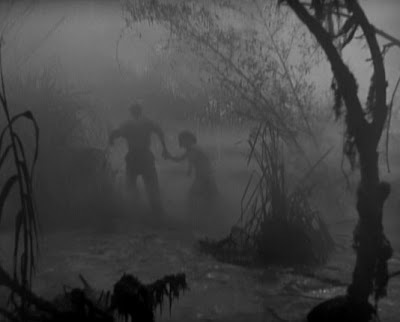 It’s so effective, in fact, that it’s now hard to watch The Most Dangerous Game without expecting a Brontosaurus to appear in the misty swamp or for an enraged Kong to appear on the other side of the log that Fay Wray and lead actor Joel McCrae must cross. 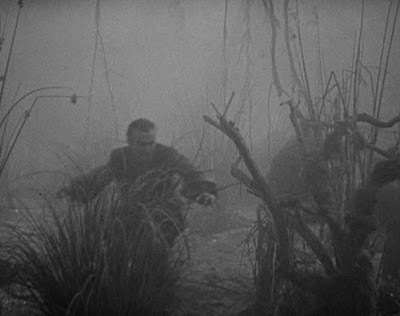 A chase through the swamp in The Most Dangerous Game (1932). A chase through the swamp in King Kong (1933). 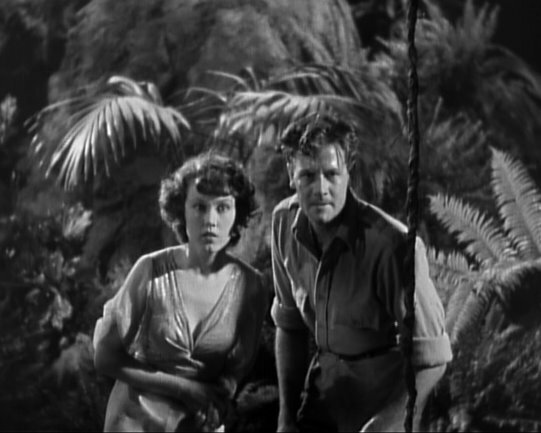 Fay Wray and Joel McCrae on the log in The Most Dangerous Game. Sailors cross the log in King Kong. Special features on the two-disc special edition, King Kong (1933) by Warner Home Video Inc.
Purchase a King Kong DVD or Blu-Ray set at Amazon or Barnes & Noble. Rent King Kong at Netflix or other rental service. Absolutely amazing! Your blog is marvellously stupendous. Essential comparisons here. 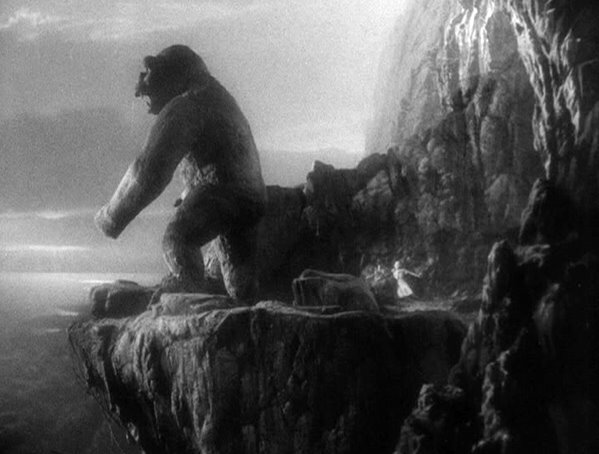 KING KONG is a movie that demands scrutiny on several cinematic levels.